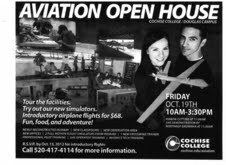 The poster pictured here advertises the Aviation Open House at Cochise Community College back in October 2012. The purpose of the open house was to showcase the college’s new aviation classrooms, flight simulators, and training facilities. Jobs and education for rural Arizona youth– what could be more wholesome? Unfortunately, the open house also shined a spotlight on the college’s cozy (and a bit creepy) relationship with merchant of death and destruction Northrup Grumman— as well as the college’s disdain for freedom of speech. The video below begins poingnantly with clips from a Cochise County Community promo about the new Aviation Center. Friendly corporate giant Northrup Grumman talks about their commitment to the community and how they built and designed the “Innovation Campus” and the curriculum. (How convenient, since Fort Huachucha is a center for drone warfare.) Later the video turns to testimony by the two activists before the college’s governing board– where they remind the board of the college’s commitment to free speech and lament the glorification of war and the militarization/corporatization of education. Do you want your children and grandchildren to build and fly killing machines? I don’t. Aren’t there peace-related jobs they can be trained for? Of course. This entry was posted on January 17, 2013 by Pamela Powers Hannley in Arizona, Economics, education, Free Speech, jobs, Military, Video, War and tagged drones, military industrial comples, war.